Representing some of the world’s communities most vulnerable to the impacts of climate change, Pacific Island countries (PICs) are already experiencing warming oceans, drought, destruction of coral ecosystems, extreme weather events, ocean acidification, and rising sea levels. With 50 percent of Pacific Island populations living in coastal areas, sea level rise risks rendering their homelands uninhabitable, a prospect that has led most PICs to do extensive adaptation planning. Despite producing only 0.03 percent of the world’s total greenhouse gas emissions, many PICs also enshrine highly ambitious emissions mitigation targets in their nationally determined contributions (NDCs) under the Paris Agreement. The imperative for Pacific Islands’ mitigation efforts is not just to reduce their emissions but also to overcome energy poverty and an overreliance on imported fossil fuels for energy and transport. The dual need to both adapt to the impacts of climate change and implement greenhouse gas mitigation strategies that deliver solutions to multiple development challenges requires a more holistic approach to planning. Easier said than done. Adaptation and mitigation can be challenging to implement together. While both aim to reduce the negative impacts of climate change, historically, policy approaches have addressed them separately. They also operate on different timescales. Long-term strategies (LTSs) typically focus on mitigation alongside sustainable development and on a midcentury (generally 2050) timescale, while national adaptation plans are usually set against national planning time lines of 5 years or 10 years. Sometimes they’re actually seen as competing priorities—even though failing to consider them together can have negative consequences, where action on one inadvertently undermines efforts of the other. Why take an integrated approach? Tackling adaptation and mitigation together can create “win-win” outcomes and efficiencies, as both take a long-term view to avoid locking in vulnerability and risk. Considering them in parallel also supports identification of potential trade-offs (where mitigation actions may undermine adaptation or resilience efforts and vice versa), providing an opportunity to manage, minimize, or avoid trade-offs that might not be identified if adaptation and mitigation planning remain separate processes. This is particularly important where adaptation and climate resilience are currently considered in the short and medium term only, such as through national adaptation planning. Taking a holistic, long-term approach can also help integrate and align a country’s multiple policies and plans, with the LTS acting as an umbrella framework. By undertaking midcentury planning across the key policy areas of mitigation, adaptation, climate resilience, and sustainable development, countries can design and implement a pathway that considers the interactions, synergies, and trade-offs of all national priorities. This holistic planning approach supports achievement of an ideal sustainable development trajectory over the long term and can guide short- and medium-term planning and goals (NDCs, national adaptation plans, national development plans, etc. ), as well as improve alignment across these often separate planning processes. It can also provide a framework for increased cooperation among different ministries, and between government and civil society, and highlight opportunities for policy harmonization. Starting from the desired midcentury end state and working backward to the present, or “backcasting,” helps a country avoid stranding assets and locking in mitigation and adaptation actions that may result in maladaption or negative resilience impacts in the future. For example, scaling up domestic biofuel production to reduce fossil fuel use may put adverse pressure on future supplies of potable water. In this way, an LTS that integrates adaptation can inform short- and medium-term investment decisions. Long-term development and climate-safe pathways that integrate adaptation can provide a framework to inform short- and medium-term economic management and development planning. By taking a holistic view, pathways can help build economic resilience, reduce investment risk, and foster new opportunities for economic growth and job creation, such as “blue carbon” industries, renewables, and energy efficiency. Pacific Island countries’ high dependency on imported fossil fuels to meet their energy needs can debilitate national budgets and revenues, impacting key productive sectors in the region. A long-term view enables a country to design pathways that consider decisions on key infrastructure investments by comparing alternative solutions against their long-term implications, thus supporting a transition toward energy independence. Decision-makers can use the tool to identify which mitigation actions they can expect to enhance or support key adaptation or resilience actions, indicating the potential for “no regrets” or “least regrets” actions in support of robust and integrated planning objectives. The SMART also can be used to identify where interactions may vary over time, or change from positive to negative, depending on the country or technology choice, indicating an area for further investigation to inform planning processes. Finally, it highlights where interactions can be expected to be negative and will therefore require a “trade-off” choice, where either the mitigation action or the adaptation or resilience outcome is prioritized. As a downloadable, Excel-based resource, the SMART is part of a suite of materials supporting PIC leaders’ development and implementation of their own long-term low-emissions development strategies. The tool was created in close consultation with stakeholders from across the Pacific and draws specifically on the work of ClimateWork’s Pathways to Deep Decarbonisation in 2050 (which was part of the global Deep Decarbonization Pathways Project).4 The project supports analysis of possible opportunities for reducing GHG emissions across all sectors of a country’s economy. In each sector, a pathways approach looks at four distinct types of actions or “pillars” to reduce emissions—detailed in Figure 1. Applying these pillars to the SMART, corresponding adaptation and resilience indicators were then summarized through evaluation of PIC’s NDC indicators. Each sector specific mitigation action was individually considered against each adaptation and resilience indicator, followed by a review of potential cobenefits, barriers, and trade-offs on both, at a Pacific regional and global scale. As impacts will vary over timescales and depending on the context of each PIC, indicators are intended to provide high-level guidance, flagging where further consideration of the technology choice or mitigation action may be required. 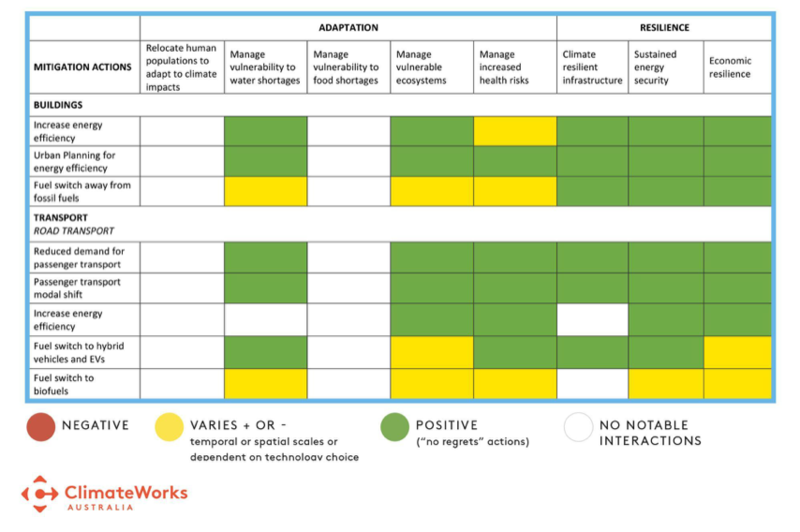 The tool also highlights that across all sectors, there are a range of “no regrets” or “least regrets” mitigation actions that can have cobenefits for adaptation and resilience outcomes—an example showing how this works can be seen in Figure 2. Findings from the development of the SMART also demonstrate that an integrated approach to including adaptation in long-term strategies is critical to minimizing any trade-offs or negative interactions. Manufacturing and Industry: While fuel switching offers a range of benefits, including economic savings from reduced reliance on imported fossil fuels, biofuels present a particular challenge in the Pacific. Fiji already uses bagasse (the residue from sugar cane processing) for most of its energy requirements within the sugarcane sector. For high Pacific Islands, other forms of biomass resources derived from waste from agricultural and forestry industries such as palm oil and wood products offer suitable sources of energy to replace fossil fuels. And yet, sugar cane production is known to have a wide range of negative environmental impacts. These include water pollution from chemicals used in cane growing, sedimentation through soil erosion, and waste from sugar production, which threaten not only the biodiversity of river systems and coastal areas but also the cultures and livelihoods of the communities that rely on them. If biofuels were considered alone under mitigation then they might appear as a viable alternative to fossil fuels, but when considered through the lens of adaptation the potential negative impacts on a country’s resilience are highlighted. Energy: Solar photovoltaic (PV) is by far the most common renewable technology in the region, with its competitive price and proven wide range of adaptation, mitigation, and disaster risk reduction benefits, notably in maintaining critical services after extreme weather events. However, as rooftop solar can be vulnerable to extreme weather when installed on nontraditional housing and roofing materials, community-scale minigrids may be more suitable for remote PICs. Though most renewable technologies are, to varying degrees, susceptible to natural hazards and extreme weather events, high quality, tested systems that have taken local contexts into consideration during the design process can demonstrate adequate resilience and minimize trade-offs. The SMART is also designed to be used as part of “Horizon to Horizon,” a Pacific Island country guide to creating long-term climate resilience, net-zero emissions development, and a sustainable future developed in close consultation with stakeholders from across the Pacific.7 The tailored guide outlines a step-by-step process, specifically for Pacific island countries, to assist in the design of their own long-term economy-wide strategies, identifying and solving roadblocks to implementation and determining financing needs and sources. Our approach and research findings were peer-reviewed by leading adaptation and mitigation experts across academia as well as by governmental and nongovernmental organizations. However, this tool is a “live” document that is intended to be downloaded and adapted to the local context by national policymakers, and it will be continue to revised and adapted over time. While the SMART in its current form is specifically for use in the Pacific, we expect that users from other geographies can easily adapt the tool to suit their country context and needs. As a replicable tool, ClimateWorks intends to translate the “Horizon to Horizon” Guide and the SMART to Southeast Asia to build momentum around net-zero emissions. We encourage readers to contact us to explore these and other opportunities. 1 Pacific Community et al., Framework for Resilient Development in the Pacific: An Integrated Approach to Address Climate Change and Disaster Risk Management (FRDP), 2017—2030, voluntary guidelines for the Pacific Islands Region, 2016, gsd.spc.int/frdp/assets/FRDP_2016_Resilient_Dev_pacific.pdf. 2 Pacific Islands Forum, “Majuro Declaration for Climate Leadership,” Forty-Fourth Pacific Islands Forum, Majuro, Marshall Islands, September 5, 2013, www.forumsec.org/wp-content/uploads/2017/11/2013-Majuro-Declaration-for-Climate-Leadership.pdf. 3 The tool can be downloaded at ClimateWorks Australia, “Strategic Mitigation Adaptation and Resilience Tool,” https://www.climateworksaustralia.org/sites/default/files/documents/publications/climateworksaustralia-smart-tool-2018.xlsx. See also ClimateWorks Australia, “SMART Guide and Briefing Paper: A Methodology and Results Paper on the Strategic Mitigation Adaptation and Resilience Tool (SMART) for Planning,” September 2018, https://climateworks.com.au/sites/default/files/documents/publications/climateworksaustralia-smart-briefing-paper-2018_0.pdf. 4 See ClimateWorks Australia, Pathways to Deep Decarbonisation in 2050: How Australia Can Prosper in a Low Carbon World, initial project report, September 2014, https://www.climateworksaustralia.org/sites/default/files/documents/publications/climateworks_pdd2050_initialreport_20140923.pdf; and Deep Decarbonization Pathways Project, home page, http://deepdecarbonization.org/. 5 Tim Farrell, “Appliance Labelling and Standards in the Pacific Islands,” Copenhagen Centre on Energy Efficiency, October 5–6, 2015, www.iea.org/media/workshops/2015/egrdoct/11Farrell_DTU.pdf. 6 Secretariat of the Pacific Community, “Pacific Islands Regional Policy Framework for REDD+,” 2013, https://theredddesk.org/sites/default/files/Pacific%20Islands%20Regional%20Policy%20Framework%20for%20REDD%2B.pdf. 7 ClimateWorks Australia, “Horizon to Horizon: A Pacific Island Country Guide to Creating Long Term Climate Resilience, Net-Zero Emissions Development and a Sustainable Future,” 2018, https://climateworks.com.au/sites/default/files/documents/publications/climateworksaustralia-h2h-guide-2018.pdf. We thank 2050 Pathways Platform, The European Climate Foundation and The Institute for Sustainable Development and International Relations (IDDRI) for their generous support towards the development of the Strategic Mitigation, Adaptation and Resilience Tool (SMART). All the interpretations and findings set forth in this expert perspective are those of the authors alone. This project is developed by World Resources Institute and United Nations Development Programme, in cooperation with UN Climate Change. The project contributes to the 2050 Pathways Platform and is undertaken in collaboration with the NDC Partnership.